There are some really popular IGT online slots around today, and we’ve got another new one to throw into the mix as well. It’s the Family Guy slot, and if you’re a fan of the TV show you’ll definitely want to have a better look at this one. Ready for some fun, Stewie? Play original games including Bar X Colossal that banks 3 pots of free spins! 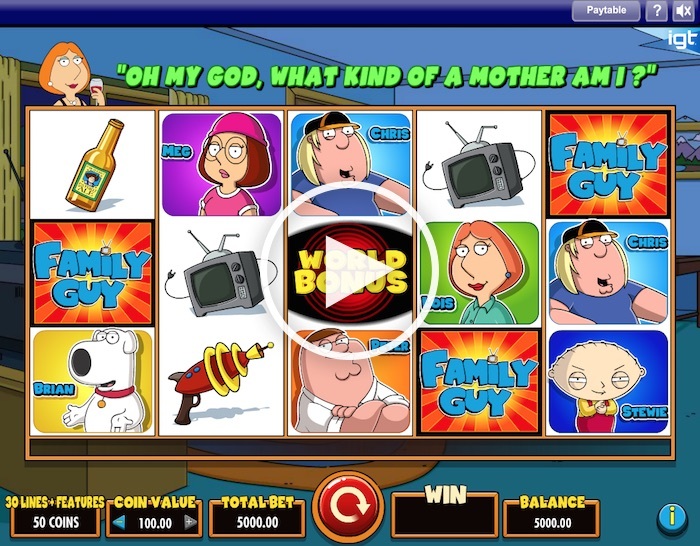 The Family Guy slot is a 5 x 3 online slot game featuring 30 paylines, not to mention a whole host of bonus features. That’s why the minimum bet on this is slightly higher than the normal per-line bet you’d have on other slot games. It’s definitely worth the extra! 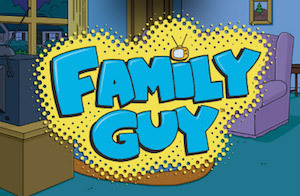 The game is based around the Family Guy TV show. All the characters from the Griffin family are here, including Peter, Lois and Stewie. Since the game is based on a cartoon, it’s easy to transfer that to an online slot, and it’s been done beautifully. But it’s not just a good-looking slot. This one is packed to the rafters with great features. It’s no surprise to discover there are 12 pages to the paytable, since it takes that long to explain everything. The graphics are great and represent the family members very well indeed. The symbols change and animate when you get a winning line. Moreover, the whole time you play there are characters appearing at the top of the screen sharing some of their classic quotes. This is a real delight for fans of the show. It’s easy to play too. You can change your coin values at the foot of the reels, and the paytable and game rules are there too. The Family Guy slot paytable starts with the base wins. Peter and Lois score highest of all, although there is a wild Family Guy logo in play that can net you 500 credits for five on a single line. Other symbols include some other characters from the show, such as Chris and Meg. You’ll also see a teddy bear, a ray gun and a bottle of beer. The four family members – Peter, Lois, Stewie and Brian the dog – each have their own Family Feature bonus to trigger. Peter’s feature can bring up to 5,000x your bet, while Stewie will bring you up to three additional wilds on the reels. Lois’ feature brings a credit prize of up to 1,000x your bet by getting one to three of six character symbols highlighted on the reels. The ones revealed will determine your prize. Finally, Brian the dog could help you gain access to the World Bonus. The Drunken Clam bonus presents you with four characters. All you have to do is choose one to get a prize worth between 25x and 1,000x your coin bet. You could also trigger a multiplier to apply to the prize of up to 5x. You also choose from a selection of beer taps to try and get as much as 750x your triggering bet. That’s just one bonus feature. The second one you could get is Lois’ Hot Free Spins. You get 10 spins to start with, featuring different symbols to the normal base game. Peter appears as a wild, and every appearance means the hearts fill at the base of the screen, next to four versions of Lois. When one of them gets three hearts, she will be a new wild. Watch for the Giggity Retriggity symbol on the centre reel – if it appears you get another five free games. Finally, our favourite is the Chicken Fight bonus. 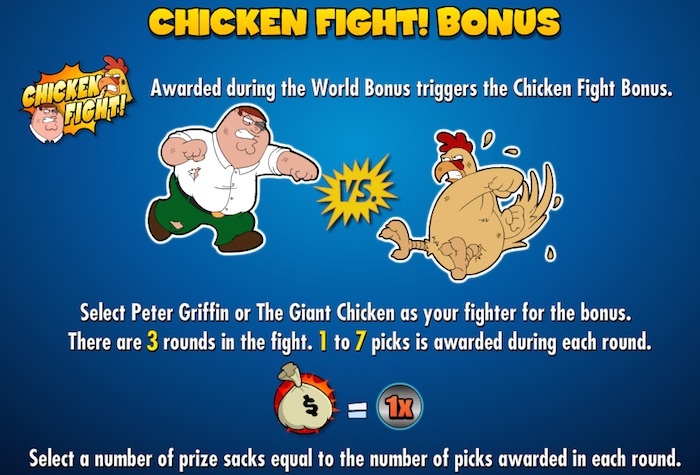 Choose between Peter Griffin and the Giant Chicken to back during a fight. There are three rounds and you get a maximum of seven picks per round. Each pick you get enables you to choose a prize sack. Every sack could potentially be worth as much as 1,000x the bet that won you the round. If your chosen fighter wins a round, it applies a multiplier as well. There’s a huge difference between the smallest and biggest bets with the Family Guy IGT slot. You’ve got 50p as the smallest bet value, which means 1p per line plus an extra 20p to cover the bonus features. At the other end of the scale, you could place a single-spin bet of a huge £1,500. The RTP for this IGT slot is between 92.50% and 96.05% according to the paytable. Meanwhile, the maximum regular jackpot win from the main game is 500 coins for five wilds. Up to 1,000x your triggering bet per win can be paid in some of the bonus features. So does the Family Guy slot match up with the best IGT real money slots already available? How could it not? You have to try it to see how much fun it is – even if you’ve never seen the show in your life.